Tax paid for French Polynesia. French Flag. Renowned and reliable sailing boat. In very good condition. 4 cabins, available after bottom paint and complete overhaul in November 2018. GRP sailboat, SUN ODYSSEY 44i type, built in 2011 by JEANNEAU shipyards, effective and comfortable. This SUN ODYSSEY 44i arrived in French Polynesia by cargo ship in November 2011, registered in April 2012 before her first cruise. 4 cabins version, with 2 bathrooms, fitted galley and recents gears. The 2 cabins fore can be joint to make a large big cabin, the bulkhead being stored in a custom casing under the berths. Then the former starboard door stands behind an additional seat around the saloon table. 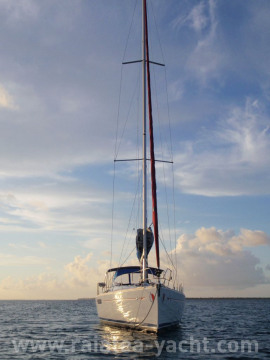 Available in November 2018, after a bottom paint and complete overhaul by Sunsail. Double sinks with pressurized fresh water and foot pump, foot pump switches to drain fridge. Maintenance by Sunsail. Log available. Reliable and comfortable sailing boat. In good condition, very well maintained.